In a previous blog entry we covered how technically and cost benificial outsourcing your FTP Hosting and Online Storage requirements is with the solutions we provide. We understand that when outsourcing it is important to maintain your company / organisation brand and colour scheme to ensure your users are in familiar surroundings. We have also covered branding techniques for our systems which includes your company logo on your FTP Hosting login screen and a custom URL / domain name for your service. We are now able to offer extended branding by allowing the full customisation of your Online Storage / FTP Server login page. This include inclusion of your company logo, customised site title / tag line, css styling, background image/wallpaper and HTML/XHTML content to wrap around your login fields (username, password, language etc). Do not worry if you do not understand all those abreviations, we also offer a design service to do it all for you too! 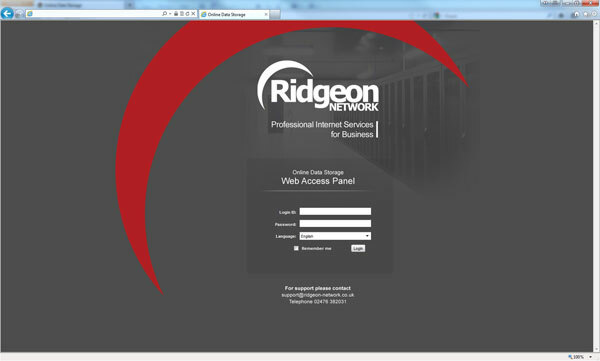 As an example, check out the example below where we have restyled and branded the login page to the Ridgeon Network FTP Hosting test site that we demo to clients.. If you are interested in setting up a fully branded FTP Server, why not request a free trial of our Secure FTP Hosting Services, please visit our Trial Request page and we'll have you up and running in no time. If you are ready to order and would like to choose a package you can jump straight to our Secure FTP Hosting Ordering Page, with sameday setup. We like to talk - If you would like to discuss your requirements, feel free to give us a call on 02476 382031 or drop an email over.